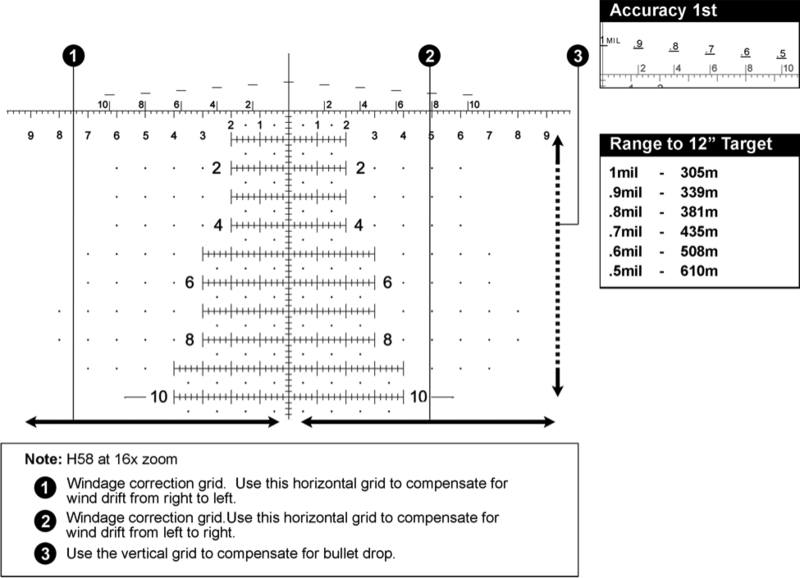 The Horus reticle is a patented grid system replacing the 40-year-old archaic mil-dot shooting method. The Horus reticle is an optically precise uniform grid etched on glass. The ergonomic design and lay-out of the reticle includes a built-in rangefinder, providing a clear picture and numeric information about the target. The H58 is a unique design incorporating all the benefits of a Horus reticle with new features for additional benefits. The H58 has extended wind dots placed at each 1 mil mark outside the main hash grid. These wind dots are unobtrusive, providing a clearer view than an extending grid, but still allows accurate holds in high winds. The H58 also incorporates the Accuracy 1st Speed Shooting Formula. This is the staircase looking pattern in the upper half of the reticle. This allows the shooter to quickly establish a hold for his rifle. These increments are in 1/10 mil and start at .5 from the outside and go up to 1 mil at the middle line. The mover numbers under each speed mil mark can be used to associate which mil to hold. By doing this, we have now built a dope sheet to perfect match our gun for these mil measurements. This will work out to 610m without ever having to know the distance of the target. As you look at your holds you have just gathered. You will notice if you take the size of the image mil of the target and remove the decimal and then add the actual hold to it. The actual holds nearly equal 10, within a moa. So, 10 doesn’t mean anything, it just becomes the numbers that allows you to remember your hold. This works really well out to 600m and allows the shooter to quickly engage a target with an accurate hold using the mil system, with an MOA, without ever having to know the distance of the target. It is a mil association drill. 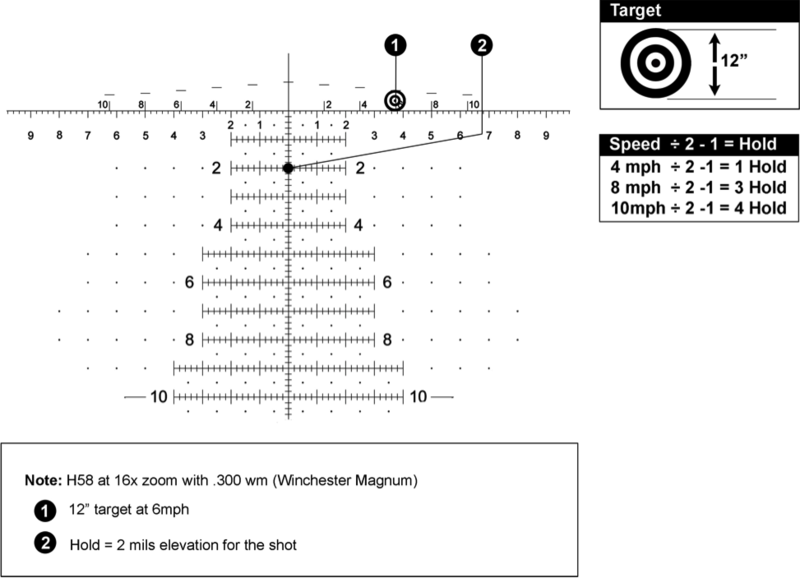 So when I designed the reticle I placed the speed shooting formula above the main stadia line. These stair steps are actual tenth mil exact measurements starting at .5 on the outside and going up to 1 mil in the middle. I placed them over a mover speed number that when cut in half, gives you a proper mil hold to equal 10. One can also use this with a gun that doesn’t equal 10. If you are using a 300wm and the actual holds equal closer to 9. You would just find where the target fits in the stairsteps and take that mover number and cut it in half and subtract 1 mil. 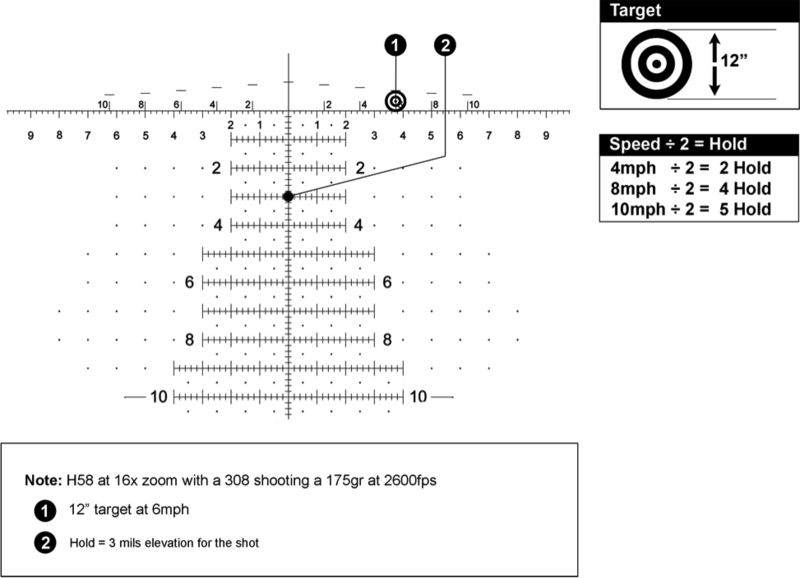 What this means is that you build the Accuracy 1st formula to your gun based off your trued performance parameters. This way, the only way you can miss, is if you miss-mil the target. Horus Vision is all about long range and extreme shooting. We're known for our patented reticles and shooting accessories. One of our main goals is supporting the troops and developing gear to benefit snipers in extreme conditions. FAQ: What are CATS Targets? FAQ: What happens to dead donkeys in Australia?